AD 1410 - Battle-hardened warrior and favored of the king, Sir Lucien de Russe is called the Iron Knight because of his indestructibility in battle. An older knight, Lucien is entering his fortieth year and has seen a good deal in his lifetime. But having sustained fairly serious wounds in the most recent rebellions against Henry IV, Lucien retires his sword and spurs, choosing to live out the rest of his life in peace. Physically, he is damaged goods and must heal. Mentally, however, he is already dead. Having lost his wife many years ago, Lucien has two children - a son who barely acknowledges him and a daughter who refuses to leave him. Lucien finds no joy in life any longer, looking back upon an illustrious career, admired and loved by the fighting men of England, yet inside, he is hollow. It is this existence he has resigned himself to when the king, believing he is doing Lucien a great favor, pledges him to a very young heiress. When the petty, spoiled girl and her pompous father show up at Lucien's home, he makes an escape. Riding south to clear his head, Lucien runs right into a robbery in progress. A fine carriage has been set upon by bandits and Lucien knows he cannot turn away. Begrudgingly, the Iron Knight goes into action once more and saves the occupants of the carriage, a mother and her young daughter. Lady Sophina de Gournay is a widow, returning home after a visit with her father. When the big, handsome knight with the long, dark hair saves her from the outlaws, a simple moment of gratitude turns into something that binds her to Lucien far more than either of them realize. It's that brief and beautiful moment in time, that wonderful chance meeting, that sets off a chain of events that could destroy them both. Join Lucien and Sophina in a romance of a lifetime, where second chances at love are something worth fighting for. What did you love best about The Iron Knight? When Lucien, the Iron Knight, saved Lady Sophina and her daughter from certain death; which changed the course of all their lives. What was one of the most memorable moments of The Iron Knight? The controversy between the conniving Earl and Sir Lucien when Lucien refuses to wed the Earl's young daughter betrothed to Lucien by order of the King; and the events that followed. Which character – as performed by Brad Wills – was your favorite? Brad Wills does well on matching most characters with their voices but I think his portrayal of Sir Lucien's young daughter was exceptional. I was moved when Lucien's young daughter tells Sophina, who is accompanied by the kind-hearted cousin/companion of the Earl's daughter, that her father (Lucien) hates her. This story was a little different than most of the stories I have heard by Ms. Le Vegues . There were a couple of dirty little secrets that surprised me. Kathryn Le Vegue is certainly a versatile writer. I've enjoyed several of her books. 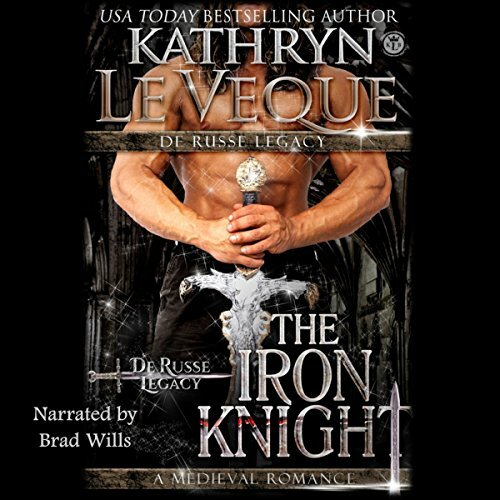 The Iron Knight kept my attention throughout. OK so this book was actually pretty good I didn't joy it however it had a little too much going on. For some strange reason this author wrote like three back to back climaxes in the story all with the same heroine in a matter of 1 Hr. This poor lady has a deal with so many issues and the setting of the story only happened over 2 day period. I'm sorry that's a little too much for one scene. Not to mention I feel like the author tried to tackle every social issue occurring in the 21st-century call during a 15th century setting. Kathryn has put her brain to work and produced another super story. Brad has put his voice to the words and kept me absolutely enthralled to the last word. I listened to it all in one setting. I LOVED it!